Cyanoacrylate, better known as superglue, is sold as a “do it yourself” (DIY) pack. The shape and colour of the superglue bottle in these packs bears a striking resemblance to the container of commonly used eye drops (fig 1). McLean reported accidental ocular injury from it in 14 patients, of which five were children.1 We have recently seen three more cases in a short interval. In separate incidents children aged 7, 11, and 15 presented with ocular injuries (corneal abrasion and eyelid closure) due to superglue. All of them recovered with conservative treatment. No long term effects were seen. Packs of Chloramphenicol Eye Drops and Instant Nail Glue. These incidents have been reported with alarming regularity for the past two decades.2–4 Have we done enough to prevent them? We highlight the need for regulating non-pharmaceutical packaging. The nail glue container used in one of our cases had no obvious warning on the front and the print was quite small. 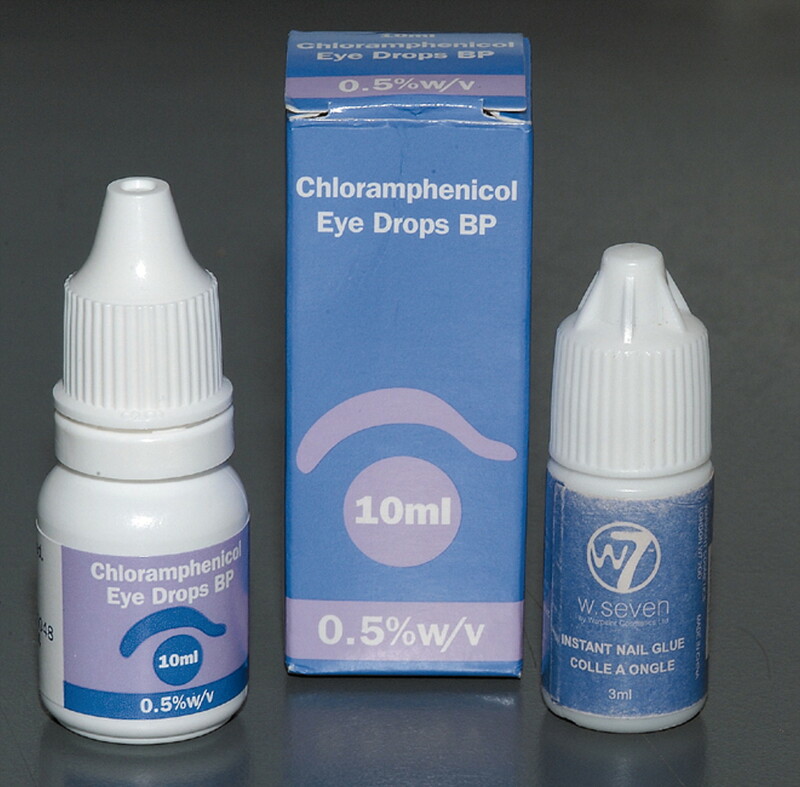 The colour is also similar to that of the chloramphenicol eye drops bottle (fig 1). There are no design regulations on plastic bottles.5 As a result non-pharmaceutical companies are free to label and produce their products as they see fit. We highlight the need for the introduction of such regulation; for example, child resistant packaging, barring overseas language on bottles, and changing the size, shape, and colour of bottles. McLean CJ. Ocular superglue injury. J Accid Emerg Med1997;14:40–1. Lyons C , Stevens J, Bloom J. Superglue inadvertently used as eye drops. BMJ1990;300:328. Knight IJ. Mistaken eye drops and subsequent instillation of superglue. Eye2001;15 (pt 5) :663. Morgan SJ, Astbury NJ. Inadvertent self administration of superglue: a consumer hazard. BMJ1984;289:226–7. BSI. Specification of containers for pharmaceutical dispensing. Part 5. Eye drop bottles. London: British Standard Institute, 1973.